Fourth release in and Safari Numerique, the sibling of the Electronique imprint, returns with a debut for an exciting new artist for us to keep an eye on, Himan. Himan aka Eduard Tavares like many, found his first musical influence in rock music. A discovery of electronic music followed and whilst the likes of Vath, Larkin, Hawtin and Dice drew him to the techno arena, he also full explored other styles. 2007 saw Himan fall head over heels for the Reason music software. A programme that enabled him to put his many musical ideas into practice. Not bound by genres, Himan’s style is uncertain and unpredictable. 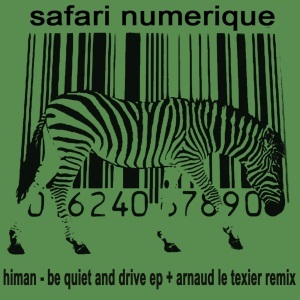 With releases lined up for Connaisseur Recordings and Galaktika Records, it gives us great pleasure to present to you his Safari Numerique release, the ‘Be Quite and Drive‘ EP. A stunning three track selection that demonstrates of host of sounds and influences, many from the classic days of Detroit and Chicago. Deep, jazzy and wonderfully executed. All backed by a remix of the title track from label chief Arnaud Le Texier. What more could we ask for? This entry was posted on June 16, 2010 at 19:26 and is filed under Release, Safari Numerique.